At a job fair last month in Seattle, Karin Smario spent several hours intently searching — not for a job, but for workers. Between the hotel-building boom in Bellevue and all the restaurants in the Greater Seattle area, the crunch that began three or four years ago has accelerated this year, she said. +46,200up 2.8 percent — the third highest in the nation. 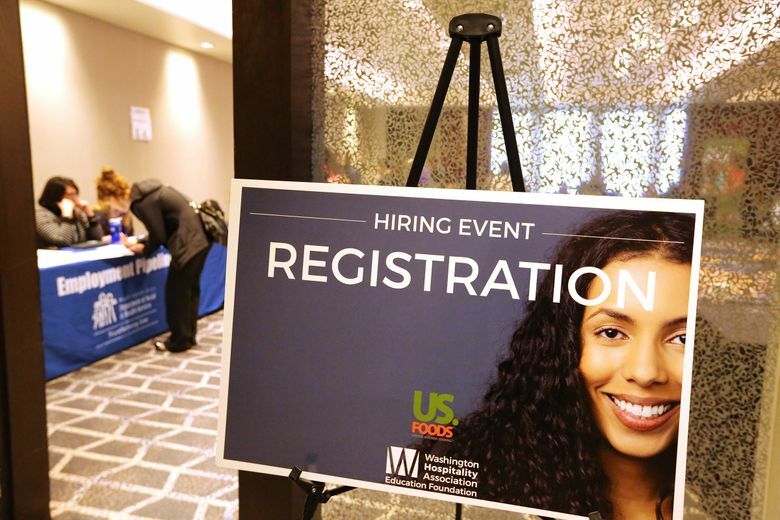 With the Seattle-Bellevue-Everett-area unemployment rate at a 9-year low, and the statewide jobless rate at a historical bottom, restaurants and hotels aren’t the only ones scrambling to find enough workers. Proof: It’s not unusual these days in Seattle and the Eastside to find job postings for dishwashers starting at $14 to $15 an hour. As competition for workers has increased, some employers at the low end of the wage scale are working to help the unemployed overcome obstacles to getting a job. At the high end, where signing bonuses have become standard at tech companies, competition for tech talent has gotten so fierce that one company is giving the right hires a $35,000-plus Tesla Model 3. Finding and keeping staff is their No. 1 business challenge, members of the Washington Hospitality Association said in a recent survey. As one way of addressing the labor shortage, the association began partnering with the state’s Employment Security Department and Department of Social and Health Services (DSHS), as well as the private-public partnership WorkSource, to host hiring events — open to the public — where DSHS clients looking for work are pre-vetted and applicants are offered jobs on the spot if they’re a good fit. Impediments to taking a job are also cleared away. 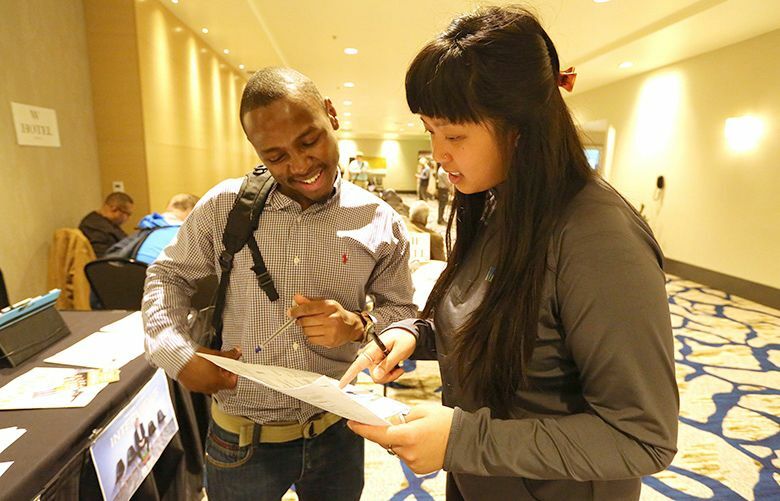 At the event last month at a downtown Seattle hotel, while HR representatives from restaurants and hotels occupied a few conference rooms, another room was staffed by social-service agencies that assisted job seekers in obtaining reduced-transit-fare Orca Lift cards, child-care vouchers and other services. Lindsay Buchanan, who heads housekeeping at the W Bellevue, said her hotel is trying to attract workers at such job and career fairs, through social media, and through partnerships with community groups such as Asian Counseling and Referral Service. Edwin Ngure, 30, was offered a job on the spot at the hiring event as a cashier at the nonprofit FareStart, which is expandingthe number of restaurants it runs to teach hospitality-industry skills. Ngure, who has part-time work as a barista and cashier at the Sheraton Seattle Hotel, said it hasn’t been difficult for him to find a job. The higher wages in Seattle may also be making it harder to fill positions for businesses there and nearby cities that don’t pay as much. Under Seattle’s 2014 minimum-wage law, the current minimum ranges from $11 to $15 an hour, depending on the employer’s size and whether it pays medical benefits. “The companies that are struggling the most — their wages are not up to $15 an hour,” said Aleni Mang, a DSHS caseworker who works with both employers and DSHS clients seeking jobs. The high cost of living, especially in Seattle and the Eastside, is also making it difficult to find employees. Indeed, living in low-income housing in Bellevue is what allowed Quang Nguyen, 47, to take a $13.50-an-hour job as a dishwasher/steward at the W Hotel in Bellevue. He had worked for higher wages in Seattle, including as a janitor. But he wanted a job that would allow him to take his kids to school in the morning. After a month of looking, he landed the position at the W Hotel in May. In some industries facing shortages, even jobs that pay fairly well aren’t getting enough applicants. Local truck drivers typically make $65,000 to $80,000 a year, said Ashley Layton, campus director with Commercial Driver School in Auburn, which teaches students to become professional drivers and places them with local companies. The tech industry, of course, has repeatedly said it needs many more workers than the country can currently produce. Technology recruiters say that in their field, competition for talented engineers has been heated for years, especially as more companies scramble for software developers with top-notch, and often specific, skills. Salaries have risen accordingly. The median pay for software engineers, for example, rose 13.1 percent over the last four years to $109,508 in May. That’s compared with median pay in Seattle overall, which rose 9.2 percent over the last four years to $59,246 in May, according to data from jobs site Glassdoor. Seattle’s F5 Networks has already hired 100 people this year, and will likely keep up the quick pace as it plans a move to a new headquarters downtown. The city’s tightening tech-talent market has “led us to be increasingly aggressive in our recruiting,” said Ben Martin, vice president of recruiting for F5. One tactic: Participating in a statewide apprenticeship program — the Washington Technology Industry Association’s Apprenti program — to help attract talent, albeit talent that will need to be trained internally. The program places chosen candidates within a local company as full-time employees, making 60 percent of the position’s full salary while they are trained. It focuses on recruiting women, people of color and veterans — groups underrepresented within the technology industry. In less than a year, Apprenti has received 1,400 applications and 55 candidates have been accepted and placed in companies such as Amazon, Microsoft and Avvo. Other companies are taking a more extravagant tack to hire technical employees. Axon, formerly known as Taser, is expanding its software division in Seattle and offers a Tesla Model 3 to new hires who meet eligibility requirements. Despite the frenzied demand at tech companies, there’s a catch: They are looking for increasingly specialized workers with an exact mix of skills in a fast-changing industry. Those tech workers seem to get work pretty steadily but they may need retraining or repackaging before they do, he said. Tech companies also hire highly skilled workers from abroad on H-1B visas. In Washington state, leading applicants were Microsoft, which sought 4,294 H-1B visas last year, and Amazon, with 2,552. That’s not to say that the labor market is tight in all industries. Manufacturing is suffering job losses, largely due to cuts in aerospace, more specifically Boeing, which has been shrinking steadily. Between October 2012 and the end of May, the jet maker shed more than 18,300 jobs in the state. The engineering union SPEEA now devotes a page on its website to helping members contact engineering companies in other states that are trying to recruit laid-off Boeing staff. At the hundreds of smaller aerospace companies in the state, the picture is much more mixed. Some Boeing suppliers have been hit by the downturn in widebody-jet production in Everett. Others are ramping up to feed the accelerating production of the 737 assembly plant in Renton. And aviation companies that service the existing fleets of commercial jets are busy as airlines hold on to older planes for longer, requiring upgrades and maintenance. Still, even in the aerospace sector, there’s high demand in some areas. John Bonner, vice president of corporate and workforce training at Everett Community College, said the students coming out of its programs with aviation and advanced manufacturing skills are in high demand. Manufacturing was the only major industry in King and Snohomish counties to report a year-over-year job loss, said Vance-Sherman, the regional labor economist. Statewide, the only shrinking sectors were manufacturing and mining or logging. Is this rosy picture for job seekers likely to dim? Washington employment is expected to grow 2.4 percent this year, according to the June preliminary forecast from the state’s Economic and Revenue Forecast Council. 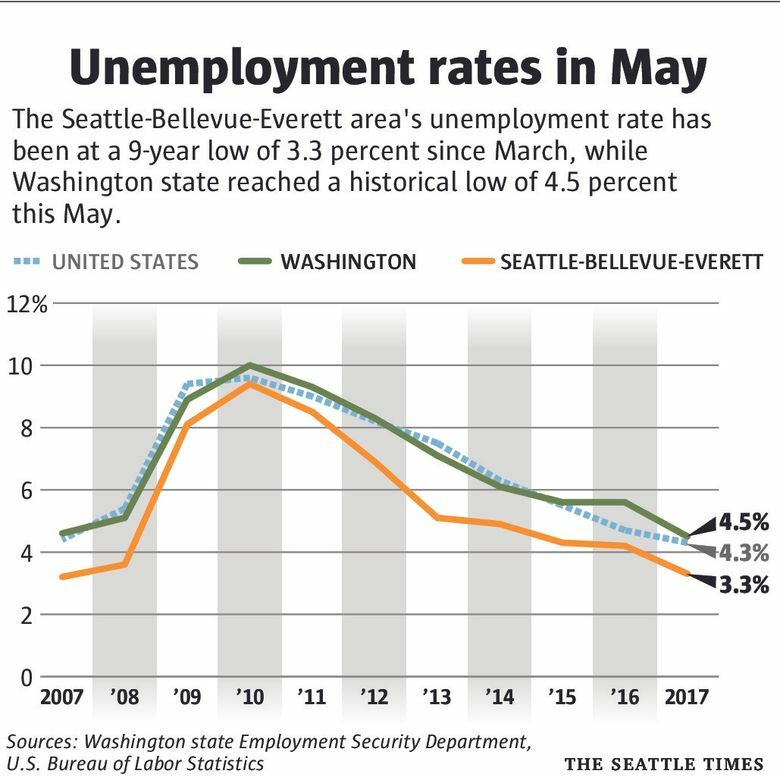 In King County, the unemployment rate is unlikely to dip below the 2.8 percent it reached in April, said Dave Reich, chief economist for the county. This story has been updated to change the description of the Apprenti program.